The WMF 2000 S is the answer to a medium demand with a daily capacity of up to 200 cups, this capacity can also be released within 1 hr. Therefore it fills the gap between presto! and bistro!. Thus, any requirement can be satisfied with the WMF product range. 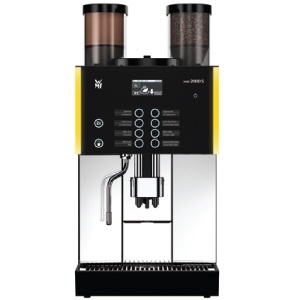 The WMF 2000 S is a fully automatic coffee machine with a high beverage quality and a large variety of coffee specialities. 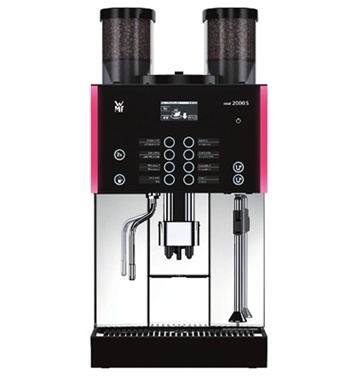 It meets the market requirements for enhanced milk-based beverage output, faster preparation times and true barista-style specialities. 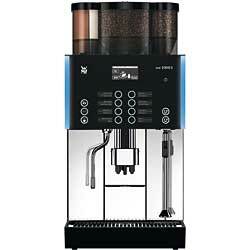 With the WMF 2000 S, coffee specialities with milk can be prepared as usual fully automatically. However, milk foam can also be prepared controlled by a sensor via the steam wand in three qualities: fine, superfine and standard. Quality Management: For espresso, after the initial extraction there is a preinfusion and postextraction; café crème, on the other hand, is brewed directly. Factors like these are stored in 5 quality levels, freely selectable for each coffee. Plug & Clean: The patented, optionally available Plug & Clean milk cleaning system effortlessly cleans all parts in contact with milk. Auxiliary Units... ...such as cup racks, milk coolers, vending units or the new paper cup dispenser make the WMF 2000 S a team player  also in self-service use.